Krzysztof Szews is a designer for a major German car manufacturer. 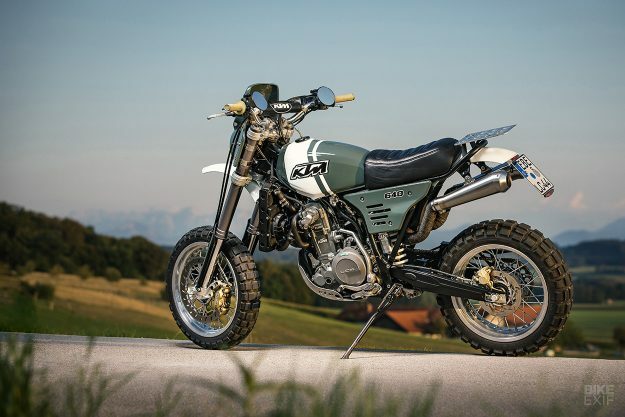 His official job title is ‘Head of Exterior Geometry’—but when he’s on holiday, he dreams up custom motorcycles like this KTM. 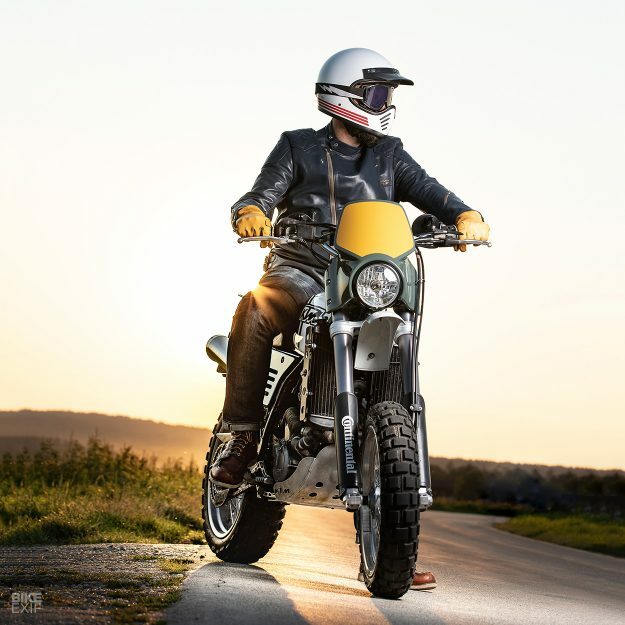 Kris’ fascination with bikes began when he was 16 and a motocross bike pulled a massive wheelie in front of him, away from the lights and all the way down the street. Kris was instantly hooked on the idea (and sound) of a big four-stroke thumper. While on holiday in the Canary Islands two years ago, he remembered the incident and started sketching in Photoshop. 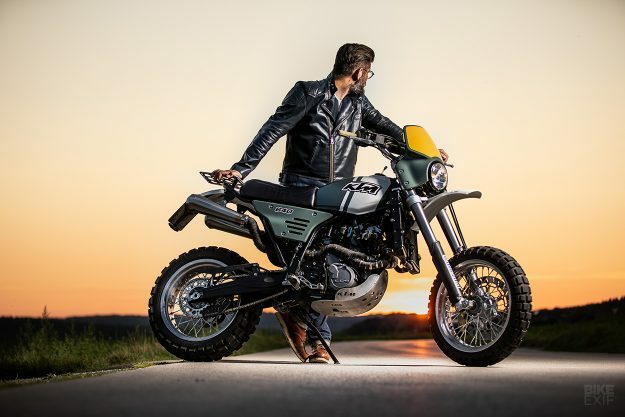 He decided to build a vintage-inspired scrambler, mixing traditional craftsmanship with modern manufacturing techniques. 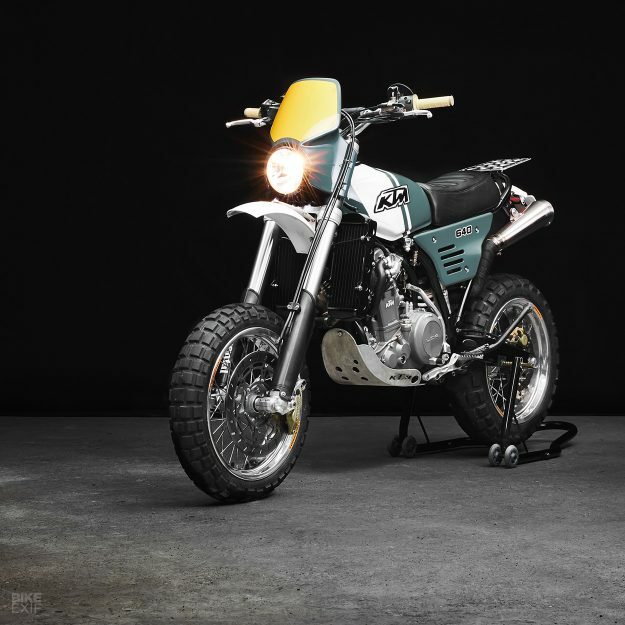 Back home, he found the perfect donor: a 2005 KTM 640 LC4 Supermoto. He rolled it into his workshop, about half an hour east of Munich, and within thirty minutes, the thumper was stripped to the bone. 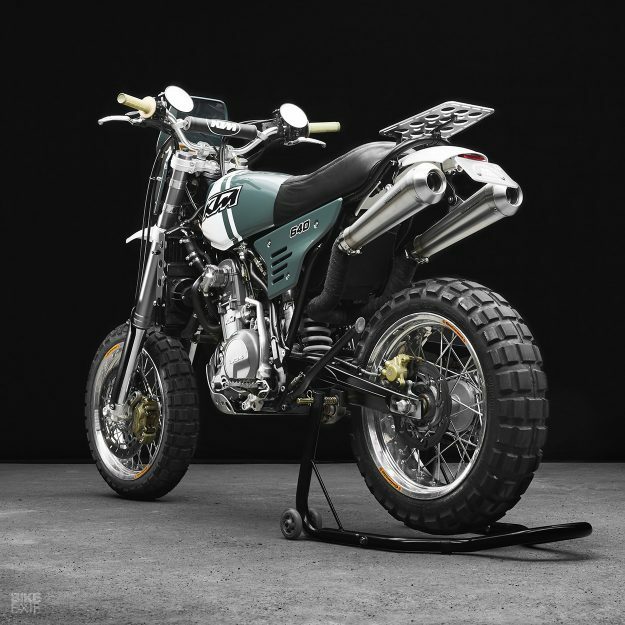 Kris tackled the project with the same process he uses at work: ‘Proportion, surface, detail.’ So his first task was to replace the KTM’s bodywork, starting with the fuel tank. A Honda XL250R fit the bill beautifully, so he ‘gently’ hammered out the tunnel to fit over the chunky frame, and set it up. The new tank didn’t gel with the stock placement of the KTM’s radiator, so Kris had to move it lower down. Next up was the rear end. Kris lopped off the stock subframe’s unsightly square tubing, and designed a 1” tubular steel subframe, incorporating the original air box. 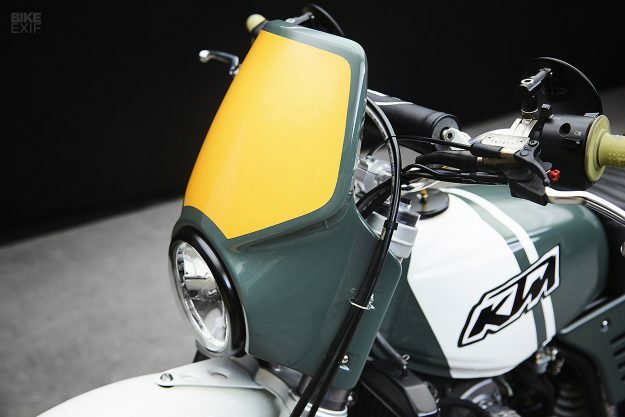 The seat was built on a fiberglass pan and upholstered in aged leather, and the aluminum luggage rack just behind it was laser-cut to Kris’ design. 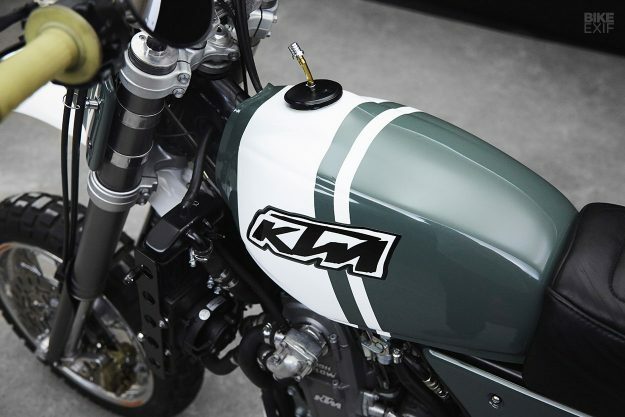 A steel rear and aluminum front fender were sourced, modified and fitted. Kris isn’t a fan of empty triangles under seats, so he designed a pair of side panels to fill the space and hide the air box. Despite their classic look, the panels (and the throwback MX-style headlight shroud) were produced using modern tech. After the whole bike was 3D scanned, Kris modeled the parts using 3D software. Then everything was 3D printed in 3 mm thick polyamide—a durable, flexible and heat-resistant material. Under the hood, Kris was dealing with a neat donor with only 17,000 km on the clock. A good service and a new chain and sprockets set were all that was needed. He didn’t see the need for performance upgrades either—but he did swap out the exhaust system. It now consists of a set of modified KTM Duke 2 headers, flowing into a pair of audacious Spark mufflers. “She’s a looker and a goer!” says Kris. With adjustable suspension and good brakes straight out the box, Kris left the running gear as-is. He just swapped out the tires for a set of aggressive Continental TKC80s; a logical choice here. 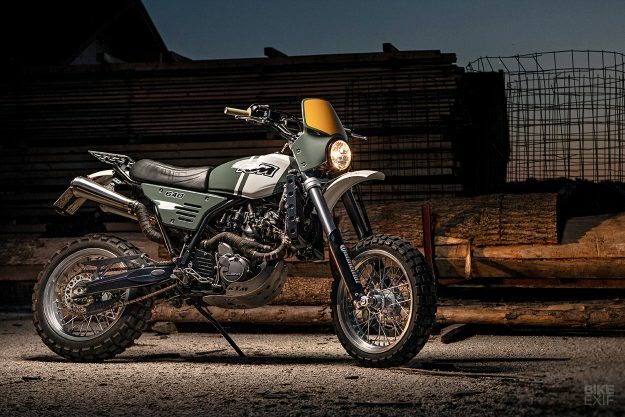 There’s a host of well-judged add-ons that pull this bike together. Kris borrowed the handlebars and bash plate from an LC4 Adventure, and installed a set of enduro mirrors. 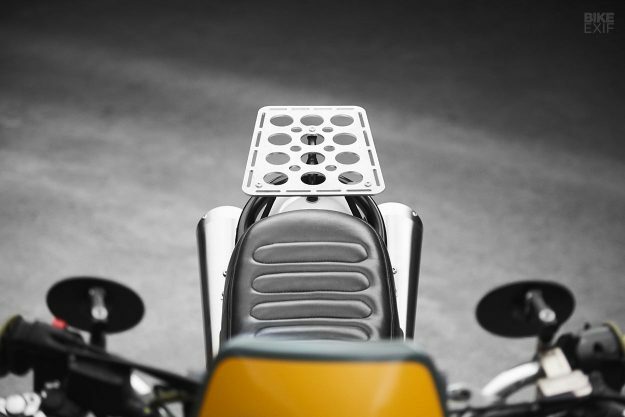 The radiator wears a pair of hand-made side guards, which also hold tiny Motogadget LED turn signals. Another set of pins are integrated into the subframe at the back, and there’s an LED taillight wedged under the fender. 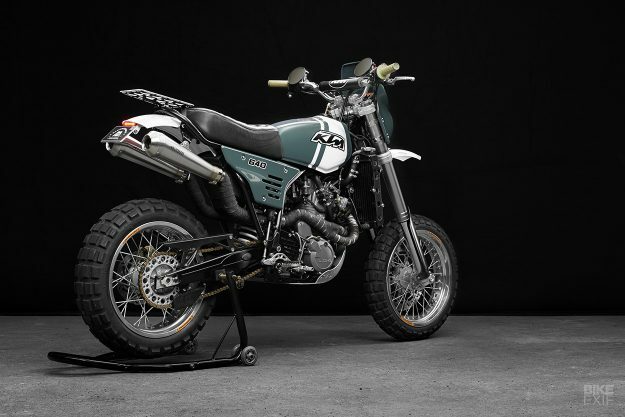 As for the KTM’s new livery, that was already decided: It’s Land Rover’s ‘Keswick Green,’ complete with Kris’ own hand-drawn interpretation of the original KTM logo. With the exception of a few specialist tasks, he handled most of the work himself—juggling his day job, his partner and their twin girls. And he’s now hungry for more, with a slew of Photoshop sketches already lined up under his ‘Man And The Machines’ moniker. He’s so hooked, he’ll be turning the Man And The Machines website into a resource for budding builders—complete with lessons and tutorials from pro builders. 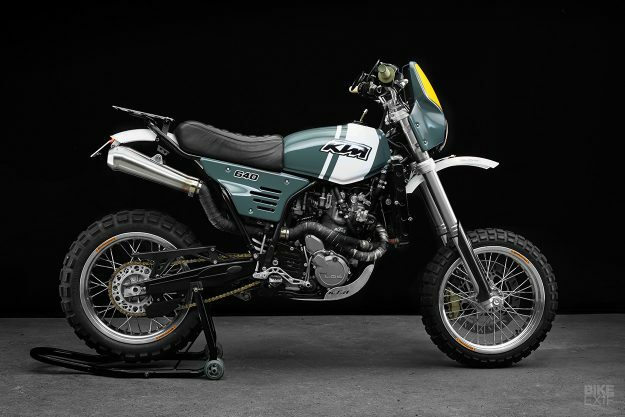 If that inspires more builds like this sweet thumper, we’re all for it.